So, here we are in October - the holidays are upon us. The holiday season is my absolute favorite. I love watching Hocus Pocus, planning the Thanksgiving menu with my Dad and decorating the Christmas tree with my littles. However, no matter how hard I try to simply savor the season - the hectic-ness always gets in the way. I find myself always running around last minute to snag Thanksgiving groceries, up all night trying to purchase the last few Christmas gifts and feverishly texting my loved ones requesting addresses for holiday cards. But this year, things are going to be different. The first thing you should know about me (and Jenny and Jess) is that we LOVE paper. If we want control over anything, making a plan is step number one. So if I'm about to take the holiday season BACK from that hectic place it's been in the past - I'm going to need paper. In this years case - the *new* KITLIFE Holiday Helper Notebook. When it comes to holiday feasts - it seems SO MUCH easier to pre-determine who is responsible for each dish - and it takes a lot of the burden off of the host. I typically take a big part in two major feasts each season (I host Thanksgiving for my family and Secret Santa with some of my besties). Both of the events are pot-luck in style, so having an area to plan everything out (and making not of who will be providing each dish) will make menu planning a breeze. Also, that grocery shopping area will help me plan the ingredients that I'm going to need to buy. Keeping track of my gift list | Ok yes, I am one of those crazy Black Friday shoppers who shops as much as I can on Black Friday (from home in my PJs mind you). But, Black Friday shopping happens soooo fast, and then packages are arriving for WEEKS to follow. As those weeks are passing - there may still be some of that "final" shopping to do. Having a running list is absolutely key for me for keeping my gift purchases organized. Keeping things even | I have a tradition of purchasing the same (or similar) gifts for my nieces. Keeping track of the gifts I've purchased on paper allows me to visualize and keep things even. Though I think it's most important to do monthly holiday budgeting (don't worry - that's in here too) Keeping an eye on your gift budget by each person has it's benefits for sure! 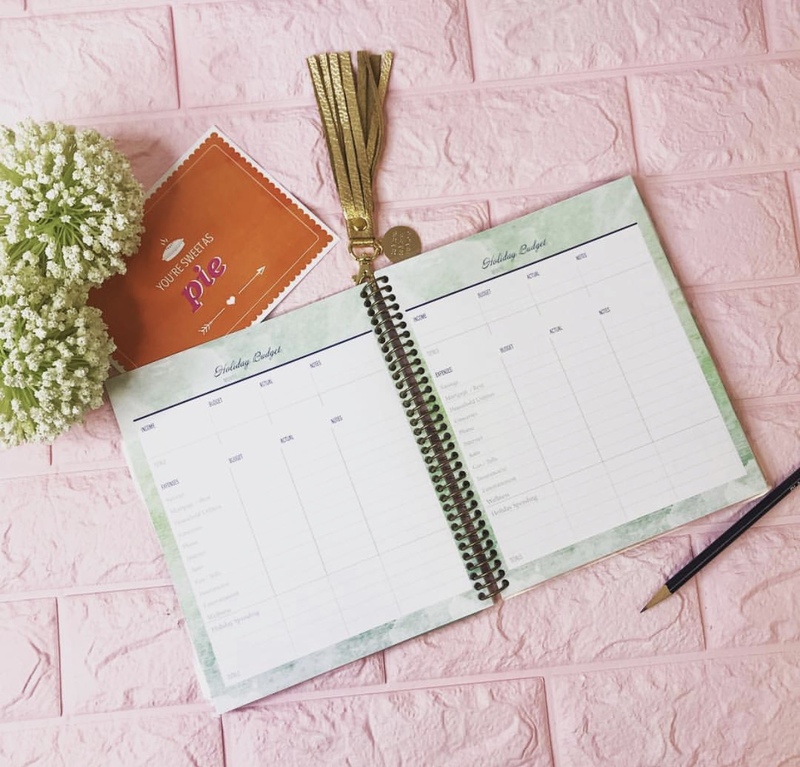 Setting a budget for each recipient is really helpful in keeping your overall budget in check - and jotting down your actual spend? Even more important. Journaling gratitude is a huge mindset changer. Seriously, if you aren't already journaling gratitude on a daily basis - you're missing out. Holidays are all about gratitude, family and friends. They should be fun, festive and filled with joy. But, we all know that the holidays can come with major stress - so dedicating your focus once a day on your gratefuls should help keep you feeling positive throughout the season. This overview was inspired by one of our very own #kitgirls - Heather Pigg (from The Sassy Mal). In years past she's doodled this concept into her KITLIFE Bujo Add-In and we've been INSPIRED. I can't wait to use this space to reflect back on 2018 and the experiences I've had, joy I've felt and the lessons I've learned. And 2019? I can't wait to visualize what next year holds for me, where I may go and the things I may do. I'll be the first to admit that maintaining my friends and families addresses is not my strong suit. It seems like every year Christmas comes and I have to reach out all over again as I frantically scribble addresses onto envelopes. This space is going to remind me to stay ahead of the game in getting my addresses organized. Oh - and I'm so going to use that 'card sent' check-mark. Nothing more embarrassing than sending a family two Christmas cards by mistake. Been there, done that. Ok, so this may be my very favorite part of the Holiday Helper Notebook. Why? Because I'm a huge fan of budgeting - and I'll take any fun tools that I can get. Now traditionally, I have my very own methods for budgeting (that include Quicken and Excel - ya feel?!) but give this girl a paper budget and I'll happily step away from my standards. We all tend to be more giving around the Holidays - which is wonderful - but it also makes it easy to break the bank. This monthly budget contains income and expenses, with a special line item for holiday spending (cha-ching!). Plan ahead so that when January comes around you wont be searching for spare change under your couch cushions. You know what is the first thing to go when we start to get busy? Our good habits. It's so easy to get caught up in the whirlwind of the holidays and forget about our goals and the habits we've developed that support us. This habit tracker is a sweet way to give ourselves gold stars when we stick to the things that matter most to us even when starring into the face of chaos! So tell us - what tools will you be using to help keep your holiday together?